There’s no better way to start off your day than with a cuppa joe. If there is one thing that can be learned from the lineups at Starbucks in the morning, it’s that we’re willing to spend serious cash to make our morning coffee routine a little easier. Let me ask you this: Where would you rather enjoy your coffee, on the patio at a crowded coffee shop or in the comfort of your own home? Almost every appliance in our homes is getting the “smart” treatment, so why not our coffee maker? Today, we’ll be taking a look at the two best smart coffee makers on the market. We’ll show you how they can make your life easier, and find out if this is a product you should buy today, or wait for the next generation. Smarter is a company that specializes in smart technology. They’re relatively new, and only have three products on the market. Their iKettle was the pre-release to this coffee maker, giving you the ability to start a pot of tea from the comfort of your phone. Ever wonder who’s been stealing the cookies at night? Smarter’s fridge cam can tell you. 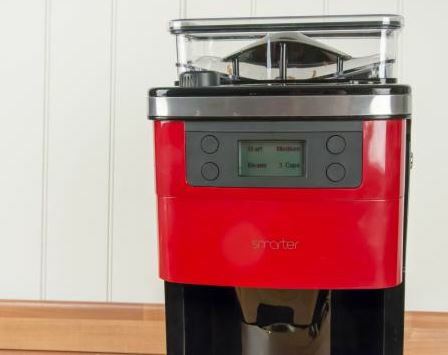 All of these products were very well reviewed, but when they announced their smart coffee machine, we had to check it out for ourselves. 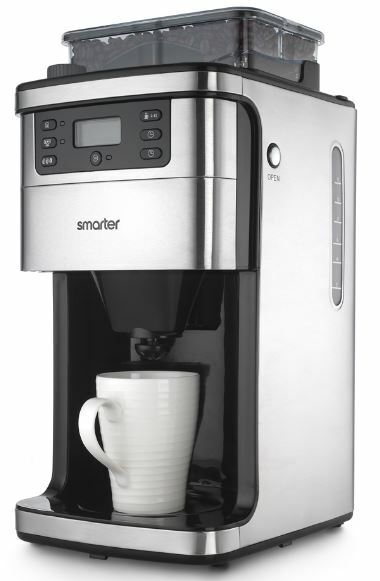 In many ways, the Smarter Coffee Machine looks similar to the standard high end coffee machines on the market. 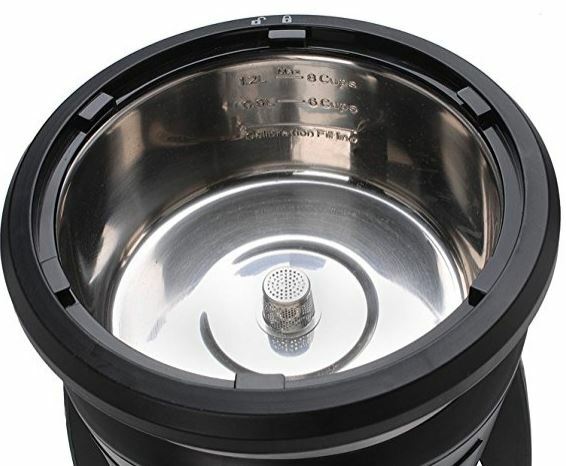 It’s got the bean hopper in the top, that allows you to store unground coffee beans and have them prepared on demand. The monochrome LCD, if you didn’t know better, makes it seem like this coffee maker isn’t quite as advanced as they say it is. But it’s still got a full-blown processor inside, it’s just that you won’t find yourself commonly using the controls on the face. With a sleek design and a large 12-cup pot, this certainly looks like a promising way to start your mornings. If you’ve been shopping for kitchen appliances, you know how important it is for them to look good. In this regard, the smarter coffee maker doesn’t disappoint. They give you three different colors to choose from. No, we’re not saying that there are three different colors to purchase. Instead, the coffee maker comes in a three in one design. The shiny metal face plate is completely replaceable, and you get all of the replacements with your purchase. You can choose from black, white, or red. Personally, we would have liked to see a silver face plate in there. Many kitchen appliances today are shipping with the brushed metal look, but we’ve found that the white faceplate actually goes quite well with metal appliances. That being said, the sides of the unit still have the brushed metal look. Unless you’ve got it packed side to side with a bunch of other kitchen tools, you’ll still be able to match it. Generally, smart devices are much easier to use than their analog counterparts. This is one of the few cases where the modern version takes a little more work than the previous. Fortunately, all of the added benefits make up for it. The first thing you’ll want to do is download Smarter’s free application for Android and IOS devices. It’s quick and easy to download from the app store, and upon opening it you’ll be prompted to begin the setup procedure. If you’ve set up a Chromecast before, you’ll know the process. 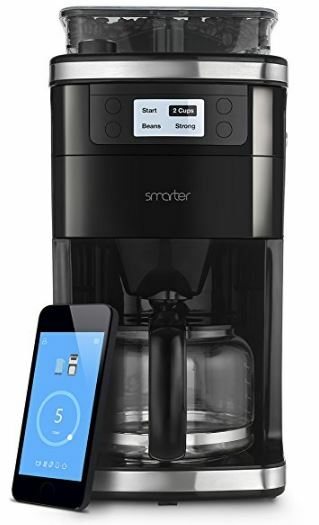 The Smarter Coffee Maker has its own built in Wi-Fi network, so you’ll be asked to connect to that to begin the rest of the procedure. From there, you can start entering basic parameters. You’ll want to connect to your home Wireless network, and you’ll be required to enter the password. Once this is done, the coffee maker is technically ready to go. But you will be asked a few questions that help it configure how your coffee should be made. There are three ways that you can brew up a fresh pot. You can use the buttons on the front of the device, the app on your smartphone, or the automated scheduling system. If you’re going to spend the money on a smart coffee maker, it would be a waste not to use the latter two options. The app is highly configurable, giving you lots of features to play with. The most important is the ability to choose how many cups you want. All of the coffee makers we’re used to just run until there is no water left. This way, you can fill the coffee maker all the way up without wasting any coffee. You can make anywhere from 1 to 12 cups, so you can make enough for the entire family if you like. You can choose how strong you want the coffee, how rough you want the grind, or even set a timer to have a pot ready in the future. This is great when you’re on the way home from work, and want to open the door to a freshly brewed pot. The coffee maker does have the ability to make coffee on a schedule. If you’re starting work at the same time every day, you can easily take advantage of this. But since it’s so easy to start a pot from your phone, we prefer to do this manually every morning. If we’re feeling a little more tired than usual, we can tell the Smarter Coffee Maker to prepare a larger batch, or make it a little stronger. When you’re scheduling things the night before, it’s hard to tell what you’ll be feeling in the morning. The built-in app is stylishly designed, going for minimalist icons and a pale blue background. It’s got a number of features that simplify the way you use it. For example, after you grab your phone when then alarm goes off it drops a notification that says “Good morning, would you like me to make you a cup of coffee?” You can then answer with a simple “yes” or “no” to have a cup brewed, just the way you like it. In many ways, this is much better than your standard timer. You don’t need a smart coffee maker to use a timer feature, but the average coffee maker has no way to opt out. Even though this is a smart coffee maker, it’s integration with your mobile phone isn’t the only thing that makes it great. It’s got an easy to wash coffee filter, so you’re not wasting the paper ones. The coffee maker also has a built-in grinder, allowing you to store enough beans for several pots of coffee. It’s also got a special non-drop coffee spout, so you can pull the pot out while it’s making coffee and it will stop the flow. This prevents any from dripping on the hot plate, and saves you from having to wait until the pots done. 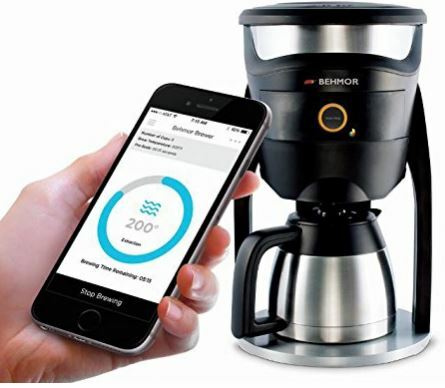 Behmor has been in the coffee maker market for many years, so creating a connected model is a natural progression for them. They took a different approach to this model, creating something that is both simple and advanced at the same time. With one large hopper straddling a large pot, the Behmor Connected Coffee Maker is a little different than any coffee maker you’ve seen before. Sure, there are a few familiar elements. It’s plastic and silver design is very similar to what’s in style these days. 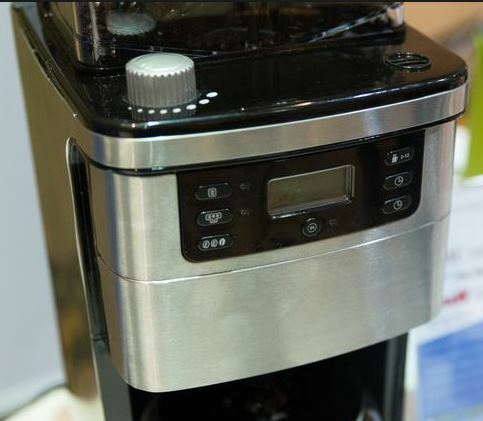 If you saw it among a row of standard coffee makers, you might not notice that there is anything different about this model. But the first time you press it’s large green-ringed button, all of its features are unleashed. Although the design is a little unusual, it’s still a very stylish coffee pot. The part that actually makes your coffee sits above the pot, supported by two large plastic beams. The top is partially wrapped with a stylish stainless steel band, with the center surrounded by an anodized aluminum ring. In the center of this ring is the start and stop button. If you’re working directly with the coffee maker, this is the only button you need. It’s illuminated by a multi-color LED ring, telling you the status of the coffee maker. Red means it’s brewing, green means it’s ready to brew. No matter which color it displays, it looks darn cool doing it. The Behmor Coffee Maker has one of the easiest setup procedures we’ve come across. It’s got Bluetooth connectivity, which it uses to automatically sync with your phone. All you have to do is download the app, open it up, and wait for it to find and connect to your coffee pot. After a moment or two, you’ll be prompted to enter your Wi-Fi password. From here, it’s simple to start your coffee brewing from anywhere in your home, or on the road. 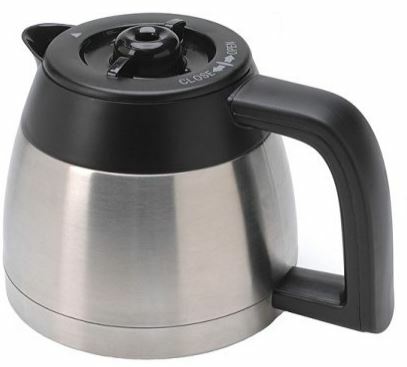 This coffee pot can be as simple or as advanced as you want it to be. We aren’t kidding about this. You can program everything down to the atmospheric elevation. This sounds complicated, but it’s made to be as simple as can be. The first time you brew a pot, you’ll be taken through a small wizard that askes you a few questions. You’ll have to state whether your coffee was pre-ground, or fresh. Another important is the roast level, you choose from light, medium, or dark. Finally, there are some settings for specialty coffees. 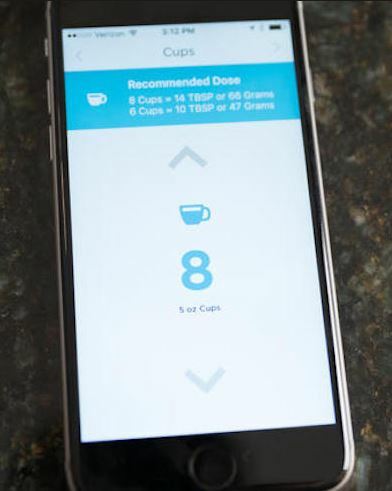 You can choose the “craft” option for an easy way to maximize the flavor from a unique blend, or you can choose from other specialty configurations listed under “Joes Brews” in the app. On launch, there are just three options available. But you can search for more online, or create your own. The app itself uses the same “flat design” as Microsoft’s latest operating system. It’s a little Spartan, but in many ways, we found this refreshing. Even as a new user, we had no problem navigating through the interfaces and understanding what each option did. Aside from the customization options, which we’ve already covered, their application gives you access to a powerful “Buzz” menu. This is like a mini social network. They’ll include recipes that pair fine coffees with easy to make foods, and allow users to share their own special brewing options. Which Smart Coffee Maker is Right for Me? If you can’t decide which of these two coffee makers to choose from, you just need to think about what you’re looking for. 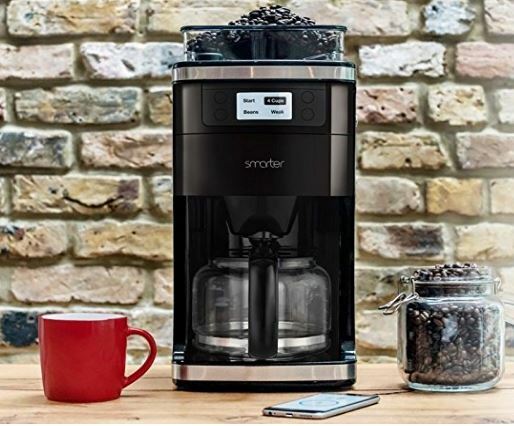 The Smarter Coffee Machine is perfect for those of you who want simplicity. It does everything from the grinding to the measuring to the brewing, making it the easiest way to prepare your own coffee. 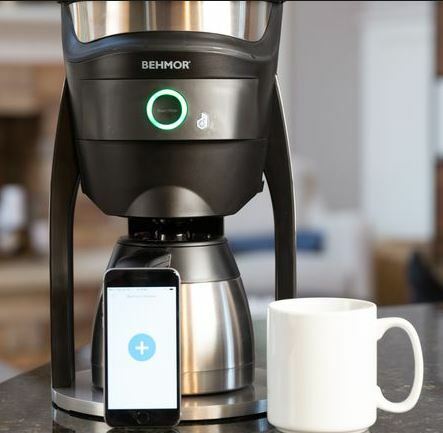 If you want control, the Behmor Connected Coffee Maker is the obvious choice. Other than the $3000 espresso machines used in fine coffee shops, it’s probably the most advanced coffee maker we’ve ever used. With all the settings available at the touch of a button, you can take your enjoyment of fine and specialty coffees to a whole new level.